As part of my next post I acquired a new toy! I've posted about a dinner I made with zucchini ribbons as part of the dish and later a bento using the ribbons. Zoodles (ribbons or spaghetti strings) have come into some popularity over recent years because of the low carb trend. Certainly a small plate of zoodles from one zucchini will save you quite a few carbs and calories than a similar plate of pasta. I figured with all the cutting calories and low carb-ing I've been doing it's high time I incorporated zoodles as a pasta replacement into a bento. Since I don't have my full kitchen here I had to find a way to cut my zucchini into noodles (or zoodle-ize them) enter "The Veggie Twister"
There are many forms of this device, in the US there's plenty of infomercials that sell the "Veggetti", I personally went with a Paderno spiralizer (it was on sale on Amazon once) back home, you can even use a vegetable peeler with a julienne blade. For the dinner I made I used a simple peeler to get the ribbons of zucchini. In the case of the twister, veggetti, and the spirooli/zpiralizer it's simply a spiral slicer. You place the vegetable in a holding device and turn or screw the vegetable in question and there's a blade at the end that cuts it into ribbons, thin spaghetti etc. You can even pre cut your vegetables to get other effects. For instance if you cut the zucchini in half it's a quick way to get thin half moon slices. And you're not limited to zucchini (although they make the best "pasta") you can use carrots, radishes, cucumber, really anything you can wedge into the cylinder. In the Veggie Twister, there are two cutter "ends" one that cuts long flat ribbons and the second that cuts zoodles. The zoodle end has a julliene blade followed by a flat ribbon blade to acheive the desired shape, the ribbon version has two flat ribbon blades. There's a vegetable "holder" that screws into each cutter end as the vegtable gets too short to continue twisting by hand. On my spiralizer when you're done you get a cylindrical "plug" which is the core of the zucchini and most of the soft seeds. The Veggie twister uses the whole of the zucchini up until the end where you get a flat coin about half an inch thick. I think the big downside here is that cutting noodles that include the seed make the strands more fragile and the less capable of holding together when they cook. Here is a shot from processing our "4th" zucchini (it looks like a lot, but it cooks down). From here you can choose how to cook them. You can eat them raw, blanch, microwave (2 mins), or saute. It really depends on how crunchy you want your noodles to be (more on prep in the next post). I find that microwaving gets the "softest" results. You just have to be careful not to over cook the noodles or they will simply fall apart. For a quick snack I'll zoodle a zucchini and pop it in the microwave with some marinara from the jar and have something yummy in 3 total mins. I think it's a great idea, eating isn't only what we taste but what we see and smell and if a visual and textural trick can help you make missing real pasta a little less I see no harm, especially if you're counting calories. Are you going to eat these and say "wow, I can't believe that's not butter pasta"?No, but in many cases pasta is simply there as a way to convey the sauce (in fact many pasta shapes are designed specifically for the type of sauce they best carry) when the pasta isn't meant to be the main star. Growing up I didn't have much in the way of traditional "American" food, my parents owned a Chinese restaurant so we had a lot of Kung Pao chicken and Happy Family. In fact we had so much happy family I started calling it "sad family". The days we got to go to McDonalds (or as they call it here down under "Mackers") or even to the Luby's and Furr's cafeteria were for me a real treat. My Mom would do her best and learn as many of the dishes we'd request (she does a killer lasagna) but I never got burned out on what most of my friends would complain about. So every once and again I would get a weird craving for what my friends would describe as they're versions of "happy family". Being away from home I've had a double craving for "American food" so I decided to do a little east meets west, healthy meets comfort American bento box. New format here. I'm trying to make these posts short but still useful. I'll post the full recipes at the end. We'll start with the star of the show: Meatloaf. As always I'm trying to be mindful of empty carbs, so I've blended together a few meatloaf variations I've been sitting on to put together a "healthy" meatloaf. I used a combo of lean meats and pork, on the spice front we have thyme, rosemary, mustard, salt and pepper, filler: I went with some soaked quinoa parsley and spinach, the glaze was ketchup, brown sugar and some vinegar (I had some apple cider from... well that's another post) and finally a couple of eggs for binder. This actually came out great, I've done a quinoa meatloaf in the past but the quinoa ended up seedy and hard on the exterior. 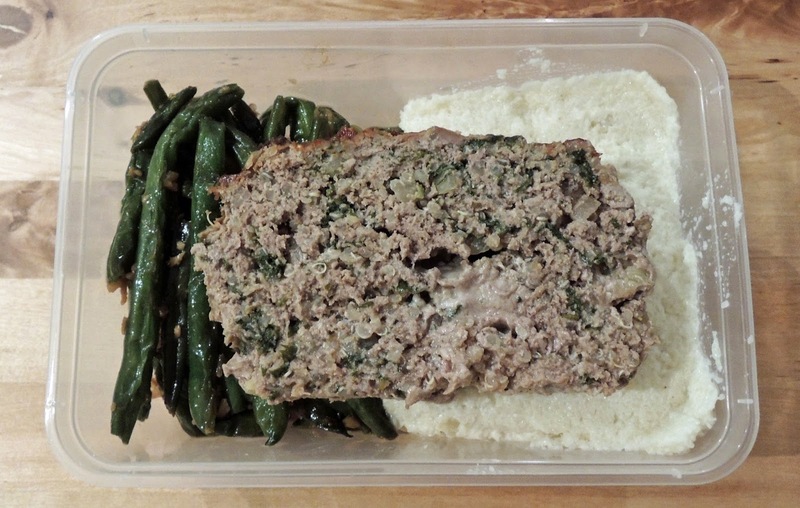 The soaking helped a lot and kept the quinoa from burning and absorbing a lot of fat and grease but still produced a moist meatloaf. And I think the quinoa blended in better than large hunks of bread that is the usual binder so it was more "meat loaf-y". The spinach was a good add as well in terms of getting some veggies in, that and it gave it some color. Instead of the standard mashed potatoes, I went with my mashed cauliflower. I posted on this before a while back, but this time around no truffle oil. 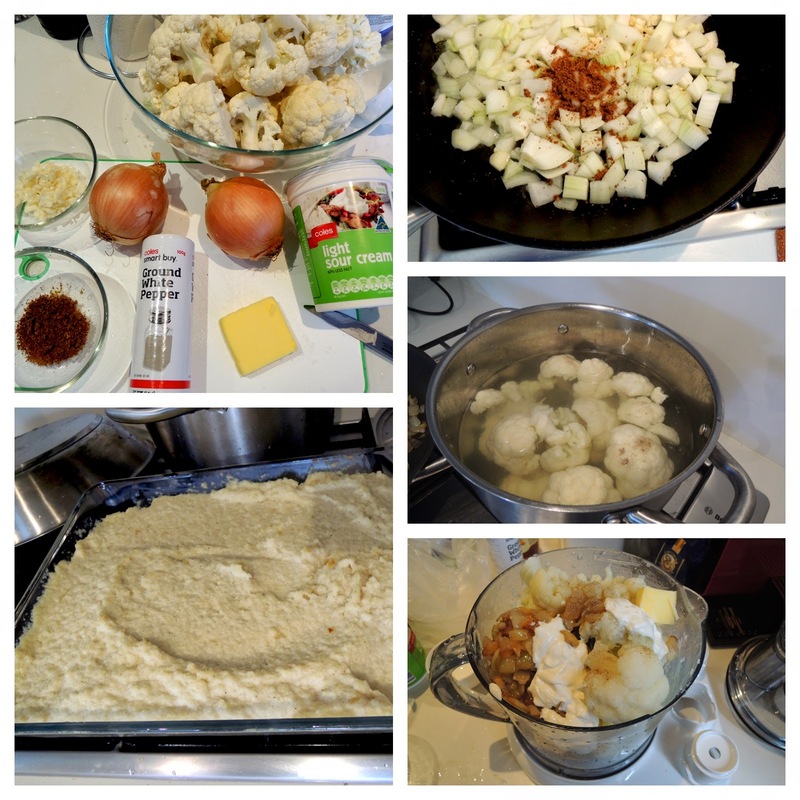 It's a pretty simple recipe: cauliflower, sour cream, butter, garlic and onion, chicken bullion and Salt and pepper. Just boil the cauliflower for 15 mins, saute onion garlic with bullion and whizz the rest together in the food processor. I tossed it in the oven and it dried it out a bit and removed some excess moisture. Here's where east meets west, I went with a four season green bean (四季豆). It's a simple green been dish sautéed with garlic and ginger with a soy sauce with a bit of sugar and sesame oil. The trick is sautéing the green beans in a bit of oil until they soften, alternatively I blanch the beans in water to retain some crunch. Then infuse some oil with the garlic and ginger and toss in the beans, soy sauce and sugar. As you plate finish with sesame oil. Heat a non stick skillet and saute spinach with a bit of water until the spinach has just wilted. Set aside and let cool. Combine meat, onion, spinach, parsley, egg, quinoa, worcestershire, mustard, salt, pepper, thyme, rosemary. Mix by hand until fully incorporated. Put meat mixture into a greased loaf pan. Combine ketchup brown sugar and vinegar and brush on to the top of the meatloaf. Bake in the oven for 15 mins then turn the heat down to 350 and cook for 1 hour or until internal temperature has reached 155F then remove from oven. 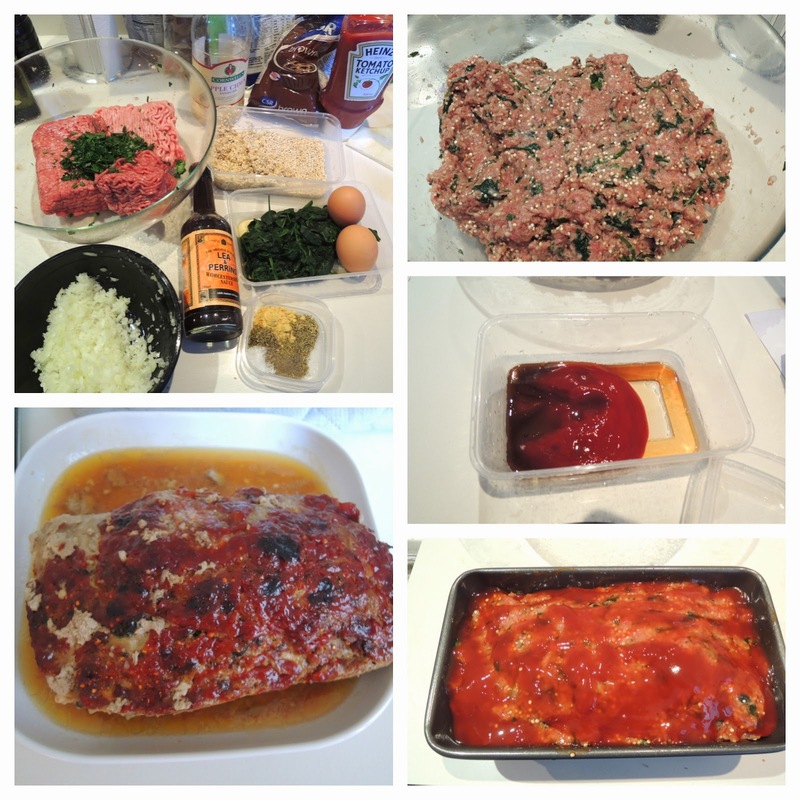 Allow meatloaf to cool at least 10 mins then remove from pan and slice into 1" cuts. Bring the salted water to a boil. Cut off the outside leaves of the cauliflower, use knife to cut out the core with a large V. Cut into large florets. Drop into boiling water, cooking until soft, about 13 minutes. Drain well in a colander. Heat olive oil on medium heat in a skillet. Add the onion, garlic and bouillon cook until onions are soft, keep stirring do not let the onions brown or burn. Combine Cauliflower, onions, 1/2 sour cream, butter, salt and pepper into a food processor and blend and add sour cream until you get your desired consistency. Put cauliflower in a casserole dish and bake for 15 mins until the top is set. 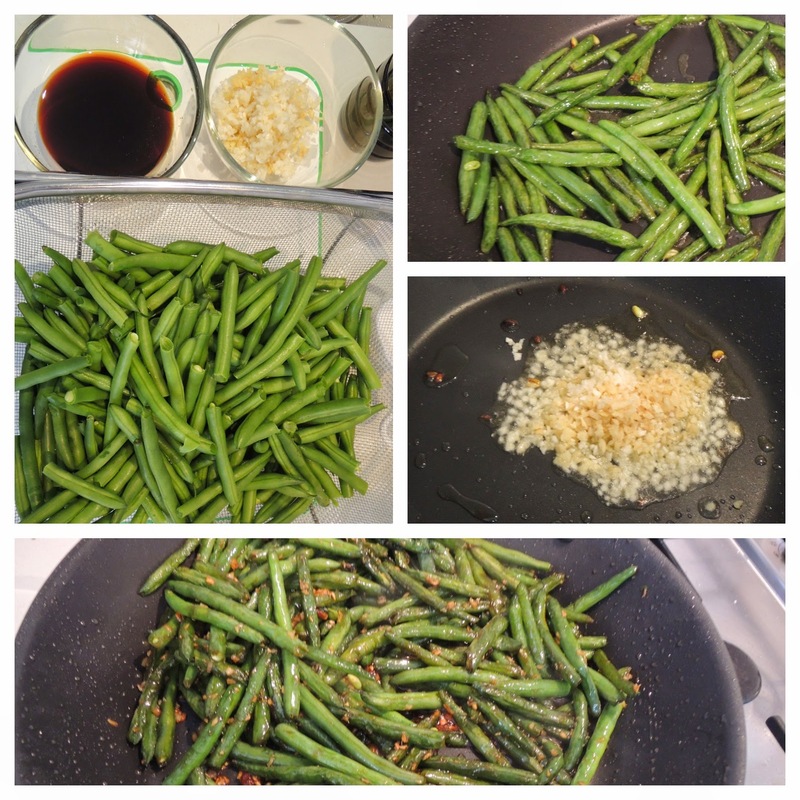 Four Season Green Beans "四季豆"
Mix together soy sauce and sugar. In a non stick skillet heat oil to medium high heat. Saute green beans until they are soft, the skins will darken and appear "wrinkled" make sure to stir continuously or the beans will burn. Drain oil into skillet and remove the beans. Reduce heat to medium. Saute garlic and ginger until garlic is soft again keep the skillet moving do not burn the garlic and ginger. Add back the green beans, soy sauce mixture, salt and pepper. Toss to combine. Turn off heat and plate. Drizzle a bit of sesame oil prior to serving.